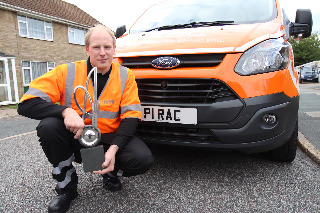 Harding, aged 28, from Swanley in Kent, has been an RAC Patrol for four years, and this year he was named as the RAC’s Patrol of the Year. The annual award is made to the patrol that has given outstanding customer service and technical performance throughout the year, and entitles them to a new vehicle with the prestigious P1 RAC number plate. Harding, who ran his own garage business before joining the RAC, said he was looking forward to tackling the MPG Marathon challenge, which kicks off next Tuesday 18 October. He said: “It’s great to have the opportunity as RAC Patrol of the Year to take part in events like this, and with the new Ford Transit Custom I’m really looking forward to seeing how it performs. Charlie will be joined by colleagues from the RAC Fuel Patrol team who will be supporting drivers throughout the event. The fuel patrol specialists will be positioned strategically around the course and on-hand to fill up petrol and diesel tanks as necessary, to keep the event moving. Jenny Powley, corporate business sales director at RAC Business, commented: “This is the second year RAC Business has supported the MPG Marathon and we’re proud to be involved once again. Although the 2016 MPG Marathon is already heavily subscribed, there are a limited number of last chance spaces still available for vehicle manufacturers, fleet operators, dealer groups or even individuals to take part.